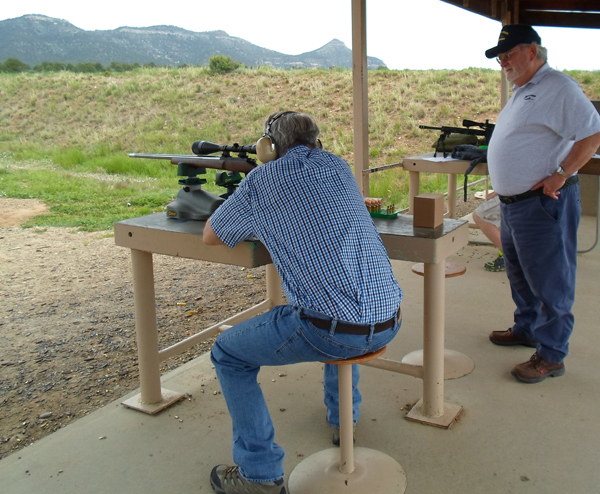 Every year in June for the past 5 years I have been privileged to be invited to teach for a week at Trinidad State Junior College in their summer NRA program held in conjunction with their Gunsmithing classes. This year was no exception other than being earlier than usual and for the first time I saw green grass from my home in Missouri across Kansas and on through eastern Colorado south all the way to Trinidad. As unusual as that was it was even more unusual to see the Arkansas River filled bank to bank. The previous two years have been plagued by forest fires. The whole state smelled like a camp ground and a haze hung over the south eastern slope for days during 2013 and 14 but those days are gone for now and I don’t think anyone there regrets it. This year my class was held the first week of June. The weather is very pleasant in southern Colorado and Trinidad is at about 6000 feet above sea level so although it is warm in the daylight hours it cools off in the evenings and the lack of humidity is a welcome relief for a soggy Midwesterner. But walking can be a chore for us flatlanders, especially for us lowland flatlanders that live under 1000 feet above sea level. The Colorado air seems to be pretty thin at least for the first couple of days. I pulled into town about 1 PM Sunday afternoon and headed towards campus. I parked in the upper level lot on campus and to my surprise found the doors open so I proceeded to look up Tool Room Dave but instead found Danny Milan who, as it turned out was to be my assistant for the week. I got unloaded in record time due to Danny’s able assistance and for the first time in memory had my class room organized for the first day before the first day. Danny is retired military, retired law enforcement and looking for a new challenge. I have no doubt he will be successful and he was invaluable to me for my week in the hot seat. My thanks to Donna Haddow for allowing me to have such an able assistant. I knew my class was full so I was prepared for that but I had forgotten opening and welcoming remarks plus program instructor introduction and orientation were to be held in my room also and there were several other classes that were introduced as well so it was 9 AM before my class was assembled and greeted. My class is titled Reloading A to Z and can be very fast paced. We start with the very basics and progress from there. Generally the first day is student introductions, basics and prep notes in the morning and the afternoon is more of that plus some equipment setup. This years class consisted of 5 novice reloaders, 4 more with very limited experience and 3 very experienced old hands that were very helpful and eager to share their expertise with the less experienced class members and the balance was made up of reloaders with good working reloading knowledge and a desire to expand on that knowledge. Five members of our class were also military veterans and my thanks goes out to each of them. The youngest class member was Zack at 18 years of age and the oldest … well I’m not touching that one. Let’s just say there were some mature adults present. In the following three days we touched on everything from how a press works to precision die setup, how to select and measure components for the best performance and finally how to assemble them for the utmost accuracy including scope mounting 101. To prove our prowess we met Friday morning at 8 AM sharp to arrange adequate transportation and took our guns and ammo 30 miles south to The Whittington Center near Raton New Mexico to show just how good we really are and I have to say that Clay Burchard proved his point very well with a 5 shot group at 200 yards that had all shots touching. Clay was shooting a sporter weight 308 with Sierra 125 grain ProHunters #2120. Not everyone had such great results but there was some pretty fancy shooting going on for sure. We had paper targets from 25 yards to 200 yards on the actual sight-in range to just over 1000 yards on the surrounding ridges. There were several ladder tests shot and evaluated and lots of scope zeroing and rezeroing but I can say that without exception the Whittington experience is a great way to end class. 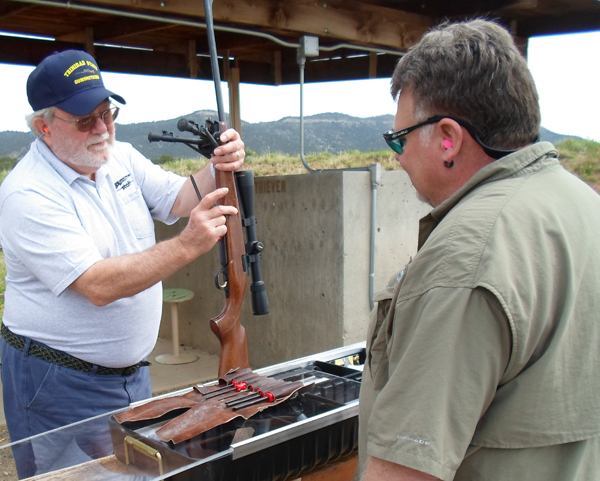 If you have a spare week next June come join us for a Rocky Mountain high (no pun intended) at Trinidad State Junior College and Gunsmithing School in Trinidad Colorado. 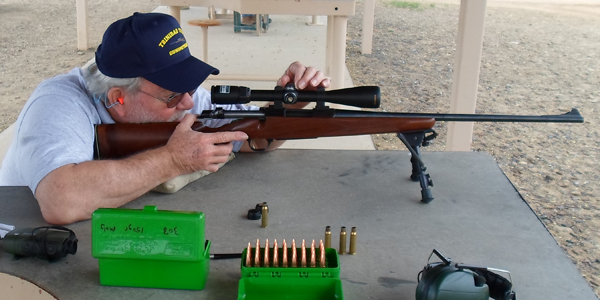 This entry was posted in Reloading and tagged gun range, gunsmithing, NRA, NRA class, NRA Whittington Center, range, reloading, reloading class, reloading training. Bookmark the permalink.